If you are planning to travel to Jeju Island in the spring season, make sure you read our ultimate spring travel guide before you go! While the spring season in Jeju Island spans from mid-March to May in general, the peak season lasts from mid-March until early April, which is when you can fully enjoy the stunning spring flowers on the island. Spring weather in Jeju is mild and pleasant. The weather conditions may vary across the island but the weather is gorgeous for outdoor activities during the day, with average high temperatures of 12~14ºC (53.6~57.2ºF). But take note that it can still be chilly at night. ※Make sure you watch the weather forecast for indication of rain before you go! Casual and lightweight clothes that can be layered work best, and wear sunscreen, comfortable shoes and hats. 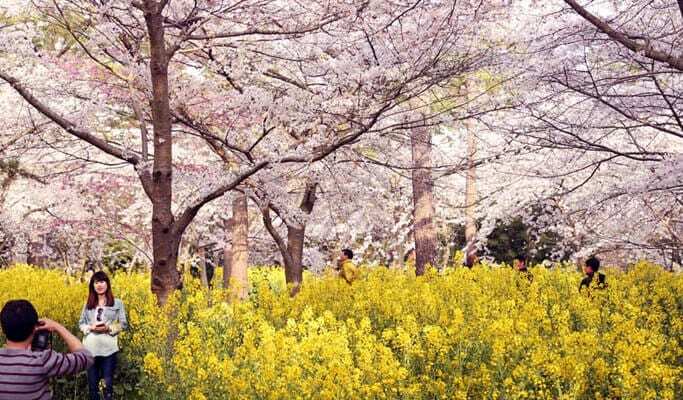 During the spring season, much of Jeju Island teems with beautiful yellow canola flowers and stunning cherry blossoms. Those who want to fully enjoy Jeju’s spring, check out the 3 best destinations where you can find the best view of these beautiful spring flowers on the island. Located on the eastern coast of Jeju Island, Seongsan Ilchulbong, also known as Seongsan Sunrise Peak, is a famous volcanic cone designated as a UNESCO World Natural Heritage Site. The peak itself does not offer canola flowers but you can find breathtaking canola fields near the peak, especially along Gwangchigi Beach. ★Tip. 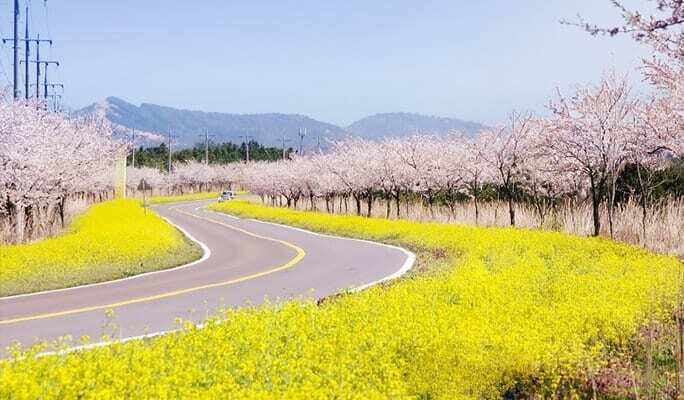 If you book Trazy’s Jeju Island Spring Taxi Tour, you will be able to stop by Noksan Road on the way to Seongsan Sunrise Peak, which is a fantastic cherry tree-lined driveway bursting with both canola flowers and cherry blossoms. For more information on the tour, click here. Hallim Park, located in western Jeju, is a must-visit park with 9 different themed gardens, two lava caves, and Jeju folk village. 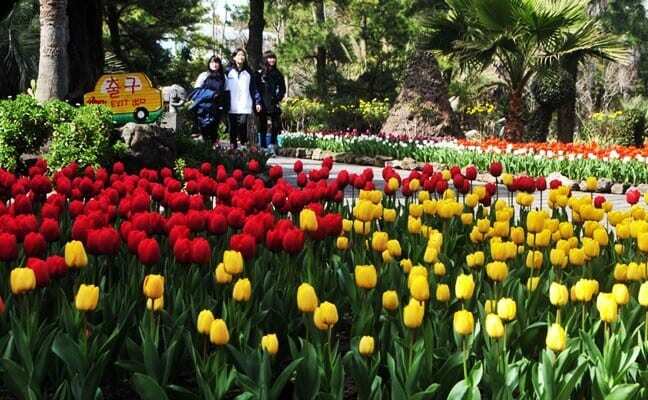 While Hallim Park holds flower-related events every month, the park will first kick off with colorful tulips in March, followed by cherry blossoms and canola flowers in April. Mount Sanbangsan, located in southern Jeju, is another must-see spring destination, which offers an otherworldly landscape. Set against the backdrop of a unique volcanic formation, the carpets of vivid yellow canola flowers are seriously Instagram-worthy! Set against the backdrop of a unique volcanic formation, the carpets of vivid yellow canola flowers are seriously Instagram-worthy! Here are Trazy’s suggested itineraries that will help you take in Jeju Island’s all the most beautiful spring flowers – canola flowers and cherry blossoms. 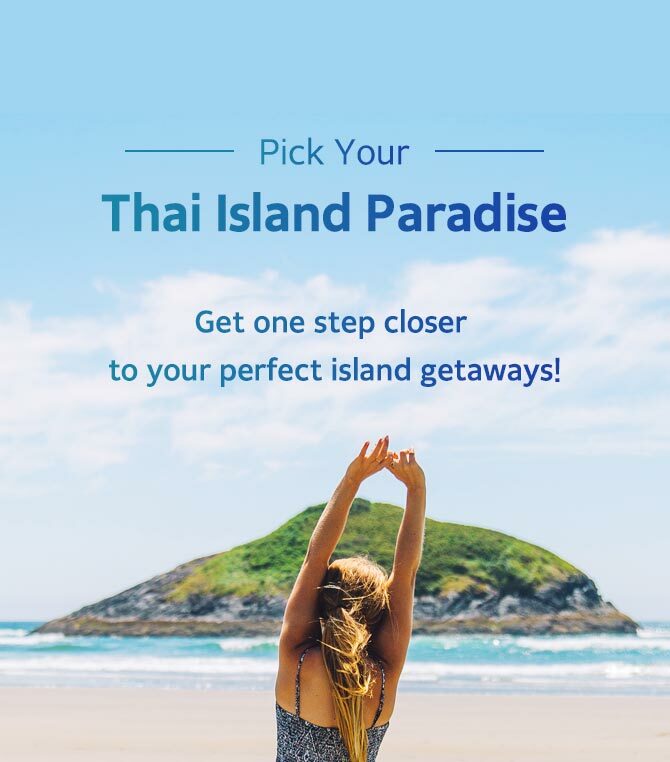 *Click on each destination for the details and discount tickets. ▶ Book Trazy’s Jeju Island Spring Flower Taxi Tour Now! With this taxi tour specially designed for the spring season, you will be able to take in the splendid cherry blossoms and the yellow canola flowers of Jeju Island. *The driver can speak conversational English so you won’t have to worry about communicating. The driver is very friendly and welcoming so you’ll be able to enjoy a pleasant private trip. Here are more travel deals on Jeju Island you may be interested in! Check out Trazy.com, Korea’s #1 Travel Shop, for more spring getaways and travel ideas in Jeju Island! Can I still do this tour on April 15 and 16, 2018 ? I don’t care about the cherry blossoms I want to see the rest of the island in those 2 days. Hello, i am planning a trip to jeju in mid april 12/15 april 2018. Will i still be able to see the cherry blossoms? To have the best of 3days in jeju what are the recommend tour MUST SEE and Do? Thank you very much. hi there, I’m planing a holiday in jeju for a week in mid april, i have a little baby girl.. any suggestion of stay ? Can I still do this tour on May 12 and 16, 2018 ? I would still love to see Jeju Island’s beautiful flowers. 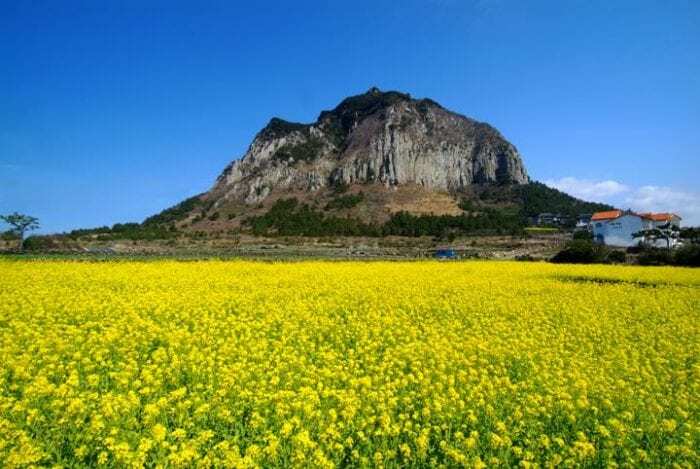 In mid-May, you may be able to see canola flower in Jeju Island if fortunate. Nonetheless, May is still a great month to visit Jeju Island (temperature is between 12°C and 23°C) and you can still catch other various beautiful flowers at various places in Jeju! Hi, I’ll be in Jeju from 25th April to 1st May. Am I able to see the canola flower? The canola usually blooms in March and April so you may be able to see the canola during your trip! What season does Jeju have during december? It’s the beginning of winter season in Jeju Island. The temperature is expected to be between 5° and 13°. I plan to go Jeju mid of March next year. Any chance of seeing the canola and cherry blossoms? I’m planning to visit Jeju in mid/end of April. I believe I won’t be able to see the cherry blossoms. But will I still be able to see tulips and canola flowers? If not, then what can we expect to see during mid-end April? I’m planning to visit Jeju Island during end of April (2-3days), Any chance of seeing the canola and cherry blossoms too? And any suggestion/event on end of April?